“I don’t think we should look for messages in films,” said filmmaker Rajat Kapoor at the Chicago South Asian Film Festival press conference this past weekend. “It’s reductionist.” Such a sentiment suits Kapoor’s movie Ankhon Dekhi (“Through My Own Eyes“), which closed the 2014 festival. It’s a film that is at its most moving when it is simply experienced. Veteran character actor Sanjay Mishra plays Raje, a middle-aged man with a comfortable life and a family he loves. He lives in a small flat in Delhi with his own wife and kids, plus his younger brother, Rishi (Kapoor), Rishi’s wife, and their son. When the gossipy priest’s son exposes Raje’s daughter Rita’s (Maya Sarao) romantic relationship with Ajju (Namit Das), Raje meets the boyfriend to see if he’s as much of a lout as everyone says he is. Raje discovers that Ajju is a harmless puppy dog of a man. This causes Raje to commit himself to only trusting that which he sees for himself. This new governing principle makes it hard for Raje to continue working as a travel agent. How can he tell a customer how long a flight to a foreign country will take when he’s never made the trip himself? Worse, Raje’s new way of operating creates a rift between him and Rishi. Ankhon Dekhi doesn’t attempt to make sweeping philosophical statements through Raje’s choices. The characters discuss broad issues, such as the aspects of language that are more convenient than they are accurate, but Kapoor avoids tying up the narrative with a tidy moral lesson. Instead, the movie feels like a window into Raje’s life for a short period of time. We see how his values affect his family and how they influence his neighbors. He gains a loyal following at the barbershop, and his acolytes sometimes take his ideas to ridiculous extremes. There are breathtaking moments in Ankhon Dekhi, when the cast and crew function in complete harmony. Look around in busy scenes such as when Raje holds court in his living room and notice how perfectly every supporting actor is executing his or her role. The acolytes listen to Raje attentively; Rita listens disinterestedly; Raje’s wife (Seema Pahwa) frustratedly tries to do her chores with a house full of people. Such scenes highlight just how hard it is to make a really good movie. The right actors need to be cast. They need to have clear motivation in every scene, no matter how small their roles are. The director has to get the technical aspects of the shot just right. There are many such perfect scenes in Ankhon Dekhi. It’s a remarkable achievement for Kapoor, who wrote the film, in addition to directing and acting in it. It’s impossible to imagine anyone executing the role of Raje better than Mishra. Ankhon Dekhi is a delight to watch. 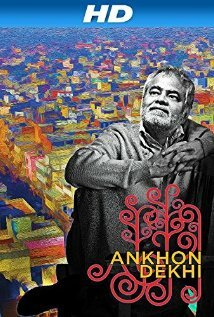 This entry was posted in Reviews and tagged 2014, 4 Stars, Ankhon Dekhi, Bollywood, Chicago South Asian Film Festival, CSAFF, Hindi, Indian, Maya Sarao, Movie Review, Namit Das, Rajat Kapoor, Sanjay Mishra, Seema Pahwa on September 26, 2014 by Kathy. I’m always apprehensive when the lead character in Hindi film is a rich kid. In a typical masala movie, the rich kid has great-looking friends, a hot car and becomes a vice president at a huge corporation right out of college. It’s a life that many filmmakers assume that the rest of us wish we were living. Wake Up Sid is more sophisticated than that. Although the main character, Sid, has a cool car, his life seems like that of a real person, and not some fantasy character. As the film begins, Sid (Ranbir Kapoor) celebrates taking his final exams with his two best friends, Laxmi (Shikha Talsania) and Rishi (Namit Das). In a rare display of realism in casting, Sid’s friends — and the rest of his classmates — aren’t all potential Miss Indias or cool dudes. They look like regular college kids. Laxmi is smart but struggles with her weight, and Rishi is an average-looking guy eager to propose to his girlfriend. While partying, Sid meets Aisha (Konkona Sen Sharma). It’s her first day in Mumbai, where she hopes to become a journalist. Sid shows her the town after agreeing that they will nothing more than friends. He bails on his job at his dad’s bathroom fixture company to help Aisha get settled in Mumbai. Then Sid learns that he’s failed his exams, while Laxmi and Rishi have passed and graduated. He vents his anger against them and his parents as well, who kick him out of the house and cut him off financially. He moves in with Aisha, only to discover that he has no ambition and no life skills. For the first time, Sid has to learn responsibility and find a direction. The film ends the way you expect it to, but the way it gets there is refreshing. Early in the movie, there’s little to like about Sid. He’s fun, but he’s spoiled and ungrateful. His tense relationship with his mother feels especially realistic; he’s mean to her in a way that only an angry teen (or in Sid’s case, a spoiled twenty-year-old) can be. As his character develops, Sid learns empathy from Laxmi, the value of friendship from Rishi, and self-sufficiency from Aisha. Sid’s maturity is so stunted that he celebrates every minor step toward independence as though he just discovered electricity. Director Ayan Mukerji is patient enough to give the audience an accurate picture of who Sid is and then takes the time to show Sid’s incremental progress, without the movie ever feeling slow. There are a few musical montages, but no unnecessary dance numbers to stop the movie’s momentum. This entry was posted in Reviews and tagged 2009, Ayan Mukerji, Bollywood, Hindi, Indian, Konkona Sen Sharma, Movie Review, Namit Das, Ranbir Kapoor, Shikha Talsania, Wake Up Sid on October 3, 2009 by Kathy.